This is the second part of a (hopefully) multi-part series of posts in which I outline my thought process as I renovate my personal website. In Part 1, I updated my personal webpage to use the static site generator Wintersmith. Next - I will do something that I’ve been waiting to do for a long time - move the site from its Netfirms host, and serve it up via GitHub Pages. Next, from inside the personal-page directory on my local machine, I will change the remote repo’s URL. 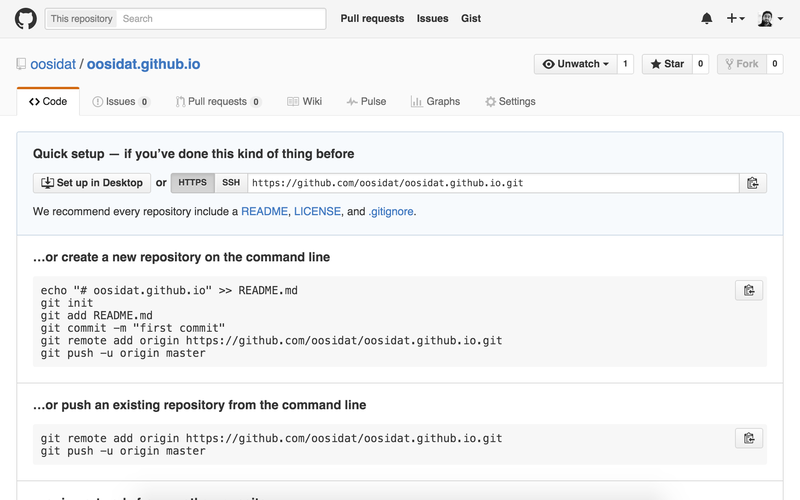 One way to go about this would be to run wintersmith build, copy the contents into a separate location, and push it to the master branch of the oosidat.github.io repository. However, this workflow can get clunky over time. Enter Gulp and gulp-gh-pages. I can use this to publish the generated contents to master without having to partake in a manual process. For the next steps, I will need npm installed. "deployclean": "rm -r build; wintersmith build; gulp deploy"
The scripts will later be used to ease the build and deploy process. 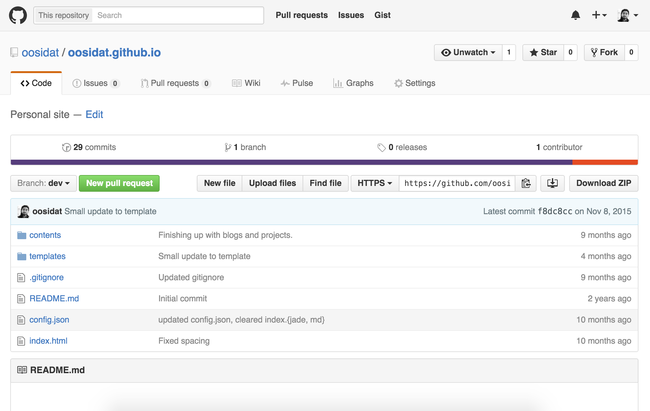 The deploy task takes the contents of the build folder and uses the gulp-gh-pages plugin to push the contents to the master - it automatically attaches a time-stamped commit message. [15:38:42] [gh-pages (master)] Adding 43 files. [15:38:42] [gh-pages (master)] Committing "Update 2016-03-05T20:38:36.012Z"
[15:38:42] [gh-pages (master)] Pushing to remote. To redirect the GitHub Pages site to osamasidat.com, I followed GitHub Help’s article about setting up the repository, and, an apex domain and a subdomain. Create a file, named CNAME under the contents folder (in the dev branch), the content of which is simply the domain being setup for redirect. 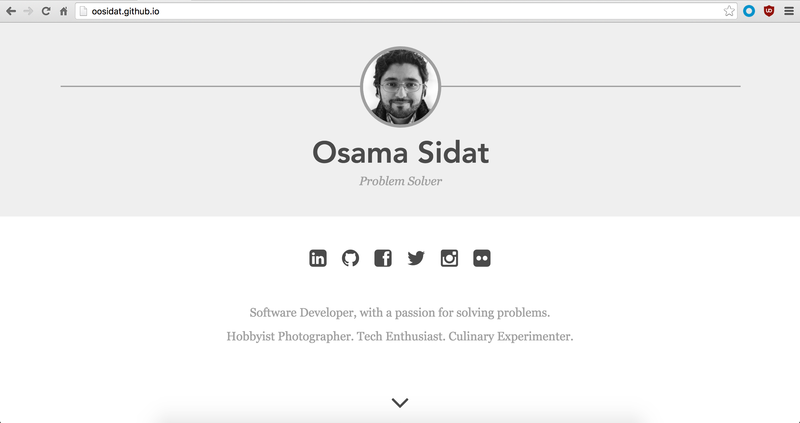 For instance, my CNAME file just contained osamasidat.com. Once deployed, the master branch will contain the CNAME file at its root. The changes may take a while to propagate, but once they do, osamasidat.com will redirect to oosidat.github.io. 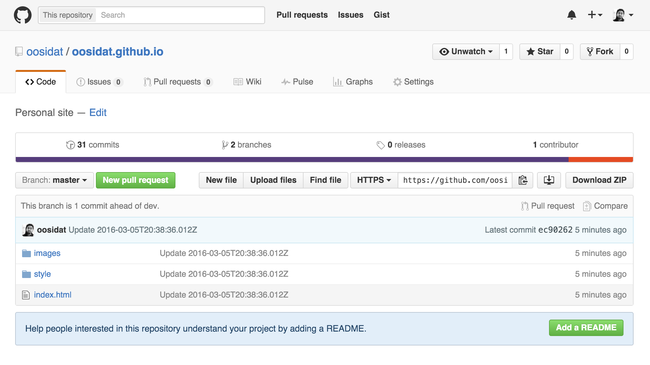 Next steps: HTTPs for GitHub Pages with custom domains. Watch out for a new blog post (hopefully soon!). At this point, I’ve finished a migration from the FTP-based Netfirms to GitHub Pages and pointed my custom domain to it.